All great events begin at the very same place - the imagination of the host. And within each one of us is where expectations are built and cherished memories reside. In much the same way, each of Embassy Suites Deerfield Beach's unique venues is the realization of a creative vision, born of imagination. They are individually designed and decorated to fulfill the fantasy that accompanies your special occasion. With dramatic spaces, blue skies, and the magnificent backdrop of the Atlantic Ocean just steps away, Embassy Suites Deerfield Beach offers an eclectic mixture of styles and surroundings. So whether you are planning a casual social gathering poolside or a formal affair in our Grand Ballroom, we will help you create an atmosphere that is not only uncommonly luxurious, but uncommonly appropriate as well. The menus for all catered events at Embassy Suites Deerfield Beach Resort & Spa are coordinated by our executive chef. Under his guidance, you can be confident that no matter the size of your gathering (from 50 to 240), each and every meal will be prepared to perfection. 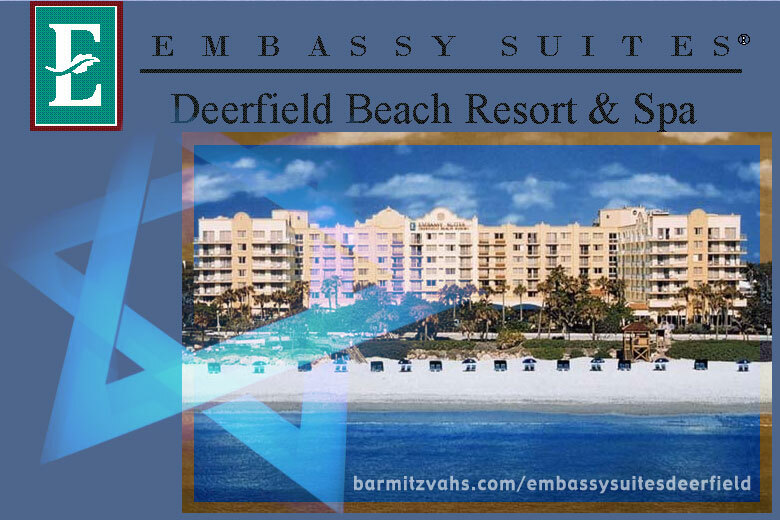 And from the initial planning of your event until the final guest departs, the staff at Embassy Suites Deerfield Beach Resort & Spa will see to it that your needs are met with the finest quality service standards.